House Speaker Mike Madigan won't meet with Gov. Bruce Rauner in Springfield Thursday, but there is the first sign of budget negotiations happening behind the scenes. Mary Ann Ahern reports. House Speaker Mike Madigan won't meet with Gov. Bruce Rauner in Springfield Thursday, but there is the first sign of budget negotiations happening behind the scenes. 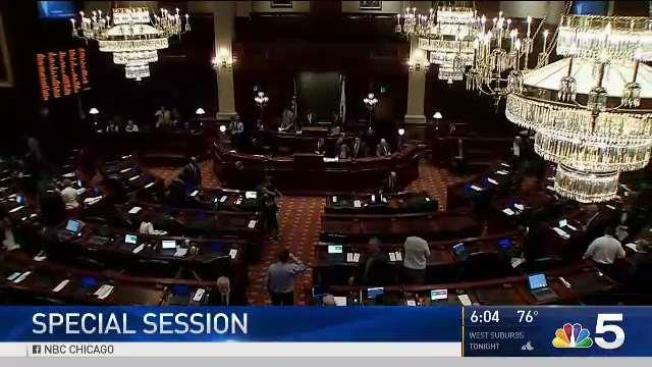 While lawmakers return to Springfield and wait for the leaders to iron out a deal-- they've been warned--don't get caught golfing during work hours. The special session is costing taxpayers $40,000 a day. So what work is going on? Not much--the house held hearings that most agree are stall tactics until those in charge hammer out a deal. In the state Senate less than two dozen showed up at the noon start. They welcomed interns to the floor and a few moments later the Senate adjourned--as they wait for they key players to strike a deal. With the governor running negative ads targeting Madigan, the speaker is refusing to meet with Rauner--but Madigan did sit down with GOP House Minority Leader Jim Durkin. Lawmakers have been told to specifically stay away from the local golf courses. Even though the hearings on the House floor are viewed by many as a way of stalling until the key leaders agree. Not only are lawmakers at an impasse on the budget--the governor also can't get a deal on his hope to sell the Thompson Center. More behind the scene meetings that will take place Friday. But the animosity between the speaker and the governor--means the governor--for now, will not be included.